We require applicants to have completed 40 hours of interpreter training specifically related to health care. Interpreting experience is not accepted as a substitute for training. Applicants are not required to have work experience prior to taking the examinations. On-the-job training (including formal training classes and shadowing or being shadowed by experienced interpreters). 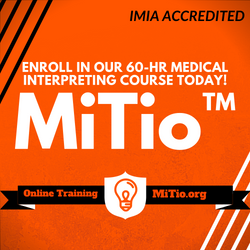 Healthcare interpreting topics that have been covered during the training, for example, “Medical terminology”, “Consecutive Interpreting”, “Healthcare Interpreters Code of Ethics”, etc. Number of hours for each of the topics and the dates this training took place. Any hours dedicated to shadowing should be spelled out, and mostly hours dedicated to debriefing/discussion of the shadowing experience are counted as training hours. Simply interpreting in different settings does not constitute on-the-job training. The document must be presented on the employer’s letterhead and signed by an authorized person. CCHI reserves the right to request for the employer’s official statement confirming the on-the-job training before approving the application. 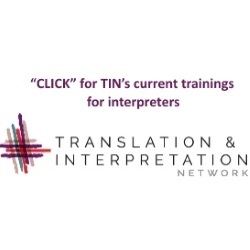 Attending interpreter/translator conferences at which you participated in workshops that discussed issues related to the practice of interpreting (in any settings) or translation – maximum of 5 hours allowed. 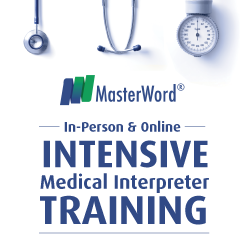 Completing interpreter training courses not focused on healthcare (e.g., court, community, conference) or completing training in the health profession (e.g. nursing, occupational therapy, social work) – maximum of 5 hours allowed. We recognize that there is some overlap between healthcare interpreting or other interpreting, and training for health professionals. However, there are also significant differences in the ethics, standards of practice, and terminology used among the respective fields. 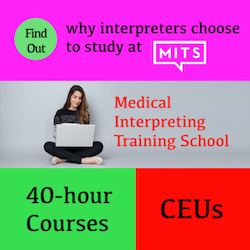 Thus, we allow applicants to count some non-healthcare interpreter related experiences towards CCHI’s 40-hour healthcare interpreter training requirement. More information about what is allowed is explained in CCHI Candidate’s Examination Handbook. Click on the button below to view some prerequisite training programs advertised by training providers on our website. The listed programs are offered just as examples; CCHI does not approve or accredit prerequisite programs.